Earlier in the year we thoroughly enjoyed reviewing the XPG SX8200, an M.2 NVMe drive with epic performance at a price which, no-doubt, made other manufactures think again about their pricing structure. The SX8200 offered most of the performance of the big-hitters, but today we’re looking at the evolution of that drive; the XPG SX8200 Pro. What’s new with the SX8200 Pro? Firstly, we get increased speeds, bumping up to 3500MB/s and 3000MB/s, read and write, respectively. The SX8200 was limited to 3200MB/s and 1700MB/s. IOPS are also vastly improved, with 390,000 and 380,000 read and write, representing around a 30% increase on the previous. Speed isn’t the only improvement, capacity also gets a little bump, with each tier being stepped up slightly, with the 480GB model now arriving with 512GB, for example. Those tremendous speeds are made possible by the usage of the NVMe 1.3 protocol, a DRAM Cache buffer with SLC Caching and 3D NAND flash; all the while, backed up with LDPC Error Correction Code. Keeping up with other offerings in the same category, XPG offers the SX8200 Pro with a 5-year warranty for the ultimate peace of mind. Pricing, however, is the key point in this sector, for a lot of prospective buyers, where the SX8200 Pro offers great value, if the claims hold true. But without further ado, let’s get stuck into the SX8200 Pro and see if XPG have managed to improve an already awesome recipe. 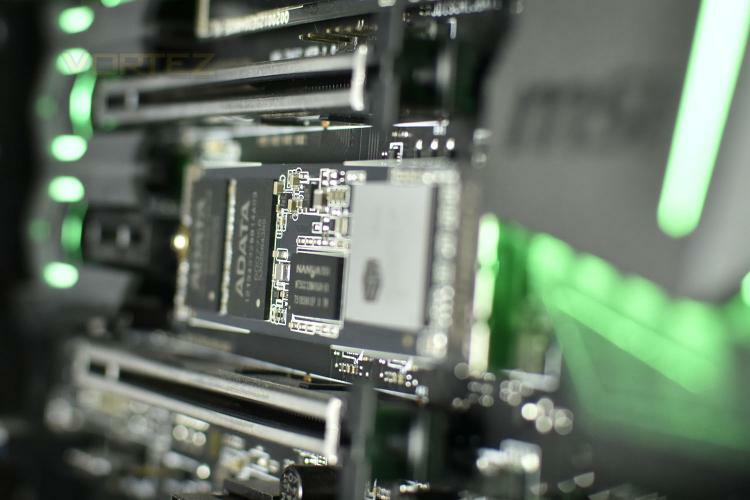 We’re testing the 512GB model, so our results can be directly compared to the 480GB SX8200.